For as advanced and as lifelike as CGI effects have become over the last decade, physical props are still the bedrock of modern special effects—especially in movies about a guy in a robotic suit. Gizmodo recently sat down with two of Iron Man 3's effects masters, Shane Patrick Mahan and Lindsay MacGowan of Legacy Effects, who have worked on the groundbreaking effects of classic films like Terminator 2, Avatar, and Monster Squad, as well as Chris Townsend, the film's Visual Effects Supervisor, to find out how much of Iron Man is really real. 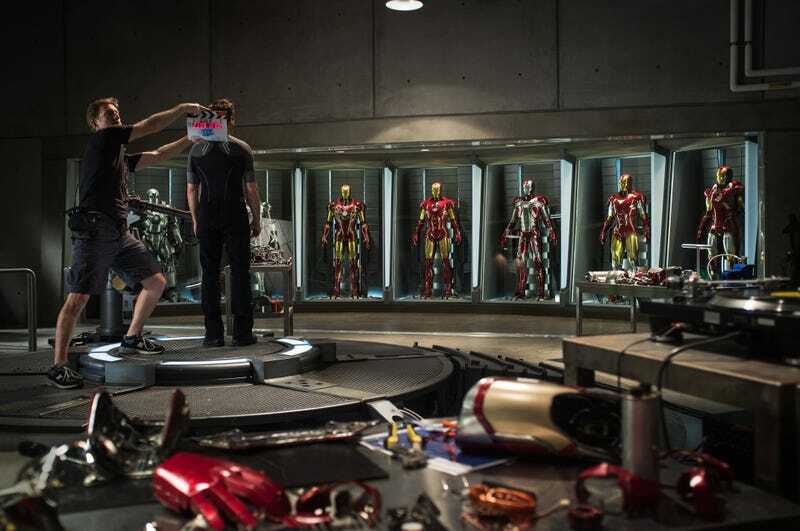 Gizmodo: Can you give us an idea of what the workflow looked like for Iron Man 3? Were you guys just presented with the script and told, “Get these shots done”? How did the creative process work with these movies in terms of visual effects? Lindsay MacGowan (LMG): Well it starts off basically with the scripts and the characters that [director and co-writer] Shane Black and [co-writer] Drew Pierce developed. It goes through the visual development department at Marvel with Ryan Meinerding [Head of Visual Development] and Phil Saunders [concept artist]. They work with Shane to come up with the suit designs. We get involved at that point to work with Ryan and Phil to figure out what works for our physical suits. So once they've gotten approval from the powers that be for the suit designs [the team begins to] physically sculpt the suits over Robert Downey Jr. and the stunt performers. Once you have a scan of the person then you make sure that obviously the suit can fit around them. Sometimes you have to change the design a little bit to accommodate the performer, so at that point, we work back and forth with Ryan and Phil [from Marvel] to make sure that the lines of the suit look right—we want to make sure that whatever we take to set is a good representation of what they've come up with. And then once that has happened, we then go through the process of making the suit itself. Visual effects companies then scan that suit to replicate it. Shots are divided between action shots and flying shots. Certainly, the laws of physics have to be taken into account. We’d have to go through and show you what’s physical and what’s digital, what are combination shots. Lately, from Iron Man 2 to Avengers until now, we have freestanding replicas in the hall of armor. Then the suit shots are basically from the waist up. They put tracking markers on the guys’ legs and expand their length. So it’s basically, for the most part, a real upper half of a suit with digital lower legs – or if it’s a close-up shot where it’s cropped off at the waist, it’s real suit shots. I've been told that this film has the most physical suit shots of any of the other films previously. GIZ: How long does it actually take to make the individual suit pieces? What are they made out of? LMG: It’s a combination of materials. There’s fiberglass, metal, real gold, urethanes—it all depends on what part of the suit needs to be flexible and what doesn’t. With [Mark] 42, there’s a lot more real metal showing on this particular suit than on some of the other suits, just because there is a lot more gold on it. There’s real gold plated on that. Shane Patrick Mahan (SPM): There’s a scene after Iron Man crash lands and he’s pulling the suit like a sled. So we built the full—what we called the “drag body”—that’s the full suit that just lays by itself. LMG: And we built parts for the sequence where the Mark 42 flies onto his body. So there’s pieces for that. SPM: Plus the gauntlet and the boot for the fight scene that’s a partial suit, where he’s fighting a guy who’s wearing just a boot and a gauntlet. That was built. The helmet that Gwyneth wears with the cut and the slice in it was built. And also the robots that are in his workshop—we built those, too. GIZ: Do you think we’re moving more towards full CGI everything like Avatar, or do you think there’s still going to be a place in the future for physical effects? SPM: There’s always been sequences of animation that are beyond what we would do. Even from the very first Terminator back in the 80s, there was stop-motion animation, which would, today, just be CGI animation. Avatar’s a different example because it’s nearly entirely a CGI existence—it’s an entirely CGI environment once you’re into the world of the Pandora planet, with exceptions including the actors and stuff like that. But even in Avatar, we did huge constructions of physical pieces—the command suit, some of the flying devices, set pieces, interior pieces—and so it’s a different kind of work. SPM: But we’re always going to argue that the shots that are real—when you can make real shots—the audience’s minds will make the connection and feel it and sense it. And I think that only enhances and makes a film more realistic. I think that, just my personal opinion, but when I know that it’s one technique or the other, when I can’t quite figure out what I’m looking at (and this is what we do for a living) and when I can’t quite figure out what’s what, that’s when I kind of rest and have a good time at the movies. GIZ: Can you speak about the equipment (programs and computing platforms) used to create the CGI effects? Chris Townsend (CT): Although the industry is always advancing, and Iron Man 3 represents the very latest, state of the art visual effects and computer graphics, we worked with evolutionary techniques, rather than revolutionary ones. As the VFX were spread over 17 different companies, in 6 different countries, we relied on the majority of 2D compositing and tracking programs available, as we did for 3D and rendering software packages too. Often, the requirements of the work needed special tools to be written, anything from more robust debris and water simulation engines, complex character rigging solutions or more photorealistic and scientifically accurate shaders to create more believable CG characters and environments. Many VFX companies who worked with us used proprietary packages, designed specifically for the huge environments, for the many characters that the film needed or for special facial capture processes for the close up fully digital character work. GIZ: Roughly how many CGI shots were used in the film and what factors influence the decision to use physical props over CGI or vice versa? CT: Iron Man 3 has just over 2000 visual effects shots, created by over 1200 people, made up of VFX artists and production teams. We always try and shoot something real when we get the chance, but often it makes more sense, from a creative, time and resources point of view, to solve things digitally; it allows the director more creative freedom, to try different things, and as the majority of our work is during post production, those decisions can be made after more of the film is completed. There are also things that you just can not practically shoot, whether it be a house being blown off a hill into the crashing waves below, the subtlety of the suit's interconnecting panels as Iron Man massages Pepper Potts, or hero actors fighting atop a 200 foot crane. However, even in those instances, we rely on plate photography. We intercut our full CG exteriors of the collapsing house with practical interiors of a huge set piece, which was built on a massive gimbal, on a greenscreen stage, allowing the set to practically split apart whilst the actors were on it. Practical dust and debris was supplemented with additional CG effects to increase the sense of mayhem. 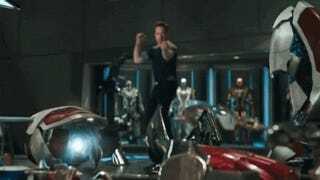 For most of the scenes with Iron Man, an actor wore a practical upper half of a suit, but for the vast majority of those shots, the suit was replaced digitally. This allowed us to make the suit do things it couldn't do practically, to alter the performance, and to enhance the general look. Having a practical suit on set, acting with, for example Gwyneth Paltrow, gave her something to react to, the Cinematographer something to light, and our VFX team incredible reference and real interaction with Gwyneth's clothing. For scenes where shooting at a real location wasn't practical, smaller set pieces were built on a greenscreen stage. Although the environment beyond was completely virtual, the shots were based on extensive still photo shoots and plate photography, and intercut with live action shots at a practical location where possible. My general rule is that if an actor physically interacts with something, it should be real, whether it be something stood on, leant against or held. The more in camera things we can get, the better; after all, our job in VFX is to make something look as real as possible, so shooting reality gets us there! CT: We realized early on that in order to get a great sequence for our aerial Barrel of Monkeys, we needed to start with something as real as possible. We wanted to really feel the action, to get the sense of free falling, the terror that comes with that. So in our first discussions with the stunt department, we decided to practically shoot skydivers, 'falling out of control' rather than trying to recreate the action on wires, on a greenscreen. The first test was if the stunt team could perform the required choreography that we intended, showing Iron Man saving people one by one. A small section of the sequence, for which we'd created a previs animatic, was chosen, and the second unit stunt coordinator and director shot a test with a stunt skydiving team. The result was a total success, proving that in mid air, the actions could be recreated. Next came the big challenge: in practice, we'd have to shoot over many days, in all light conditions, from a much lower altitude, over the wrong terrain, with skydivers wearing parachutes. We needed to imply that the fall was continuous, from about 30,000 feet to sea level, over a Floridian coastline rather than North Carolina, where we would be shooting. It would require us to rotoscope all the skydivers, in every shot, replace the background with a digital matte painting of our new environment from the correct altitude, unify the lighting so that shot to shot things would look the same and paint out the parachute packs. We did some tests, based on that first shoot, to find out how far we could stray from the original photography, particularly in terms of lighting, and to see if we could replace the backgrounds and still keep that visceral, scary feeling. The test went well, so the actual shoot was planned. Over a period of about a week, doing up to 10 jumps a day, the team of about 15 skydivers performed the various moves and stunts. We then took that footage and began the very intense process of replacing the backgrounds, balancing the lighting, painting out any of the specially built parachute packs. And we'd need to blow up a CG plane, add CG clouds and falling debris, and replace the Iron Man stunt skydiver with a full CG one, with specially created thrusters and animated aerodynamic panels. The finalé of the sequence is as Iron Man safely drops the group, one by one, into the water. This was achieved by suspending the same stunt skydivers on a massive 14 person zip line wire rig, and flying them between massive cranes, along the Cape Fear river. We then painted out the mass of wires, replaced the backgrounds, changed the brackish water to a more Floridian blue, and added in Iron Man. The aim was to always retain the raw, photographic nature of the real stunt, with dramatic but achievable camera angles, and never turn it into an obvious visual effect; in the end, every shot was dramatically altered by artists, but hopefully it was done in such a way as to still feel totally believable. Iron Man 3 is now in theaters. You can read our review here.